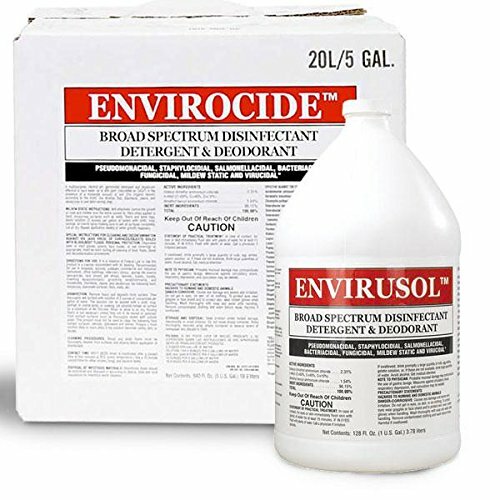 This is a concentrated, industrial-strength, multi-purpose germicidal detergent that disinfects, cleans and deodorizes. Kills canine distemper, feline leukemia and other viruses. Controls canine parvovirus. Comes with a spigot and used in animal quarters and does not need to be rinsed, unless animals contained are very young or sensitive. Leaves a refreshing wintergreen scent. Dilution: 2-ounce to a gallon of water. Use on nonporous surfaces such as floors, walls, metal, cement. Rinsing is not necessary. Not recommended to use a pump-it is a bag, and might puncture. Can be used in animal quarters and does not need to be rinsed, unless animals contained are very young or sensitive. Active Ingredients are didecyl dimethyl ammonium chloride 1.54 percent, N-alkyl dimethyl benyl ammonium chloride 2.31 percent, inert ingredients 96.15 percent. Available in 1-gallon size. Measures 12-inch length by 6-inch width by 6-inch height. If you have any questions about this product by TROPICAL, contact us by completing and submitting the form below. If you are looking for a specif part number, please include it with your message.